The first Royal Enfield Cafe Racer - the Clubman S - was developed with the experience of Norman Hyde, formerly of Triumph, to provide a true period cafe racer. All the components unique to the Clubman were British made, and each machine was hand built and tested at Watsonian Squire's factory in Gloucestershire. The Hayward standard specification included AM18/20 tyres and chrome air box, mudguards and chain cover. This cafe racer styled version of the acclaimed Bullet Electra, powered by the new all-alloy lean burn-engine, was launched at the NEC Motorcycle Show in 2005. The composite GRP tank, which encased a steel fuel tank, and GRP solo seat unit gave the Sportsman a radically different appearance to the standard Bullet. This was further enhanced by chrome mudguards, rear-set footrests and ace bars. 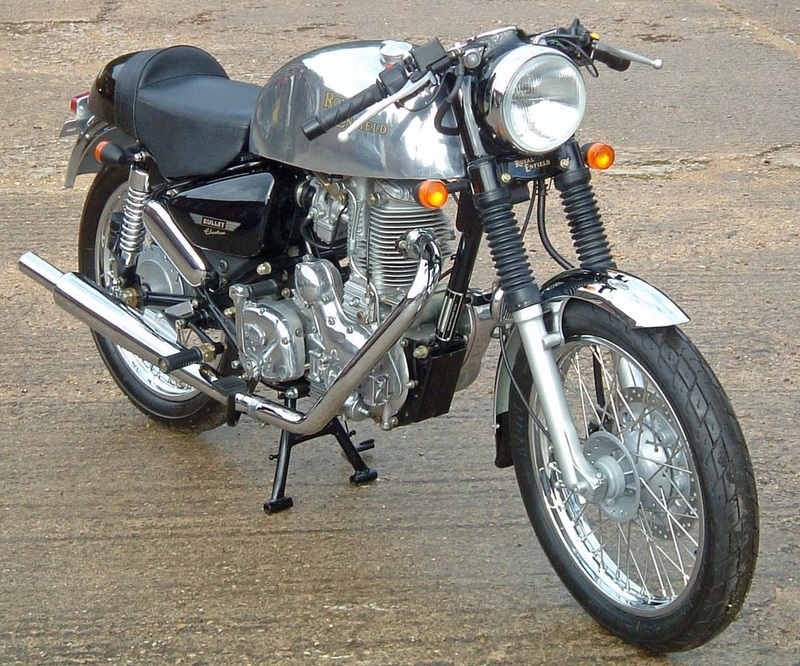 An upswept “Gold Star” style silencer completed the picture and gave the Sportsman a truly authentic ‘British single’ exhaust note that turned heads wherever it went. In terms of performance the Electra Sportsman was a significant leap forward from previous models which still used the 1950’s-designed unit. The new lean burn engine offered improved reliability, better fuel economy (regularly returning over 75mpg) and lower emissions. Perhaps even more importantly, the combination of a 32mm Dellorto carburettor and sport silencer allowed the engine to breath more freely, producing 30 bhp. 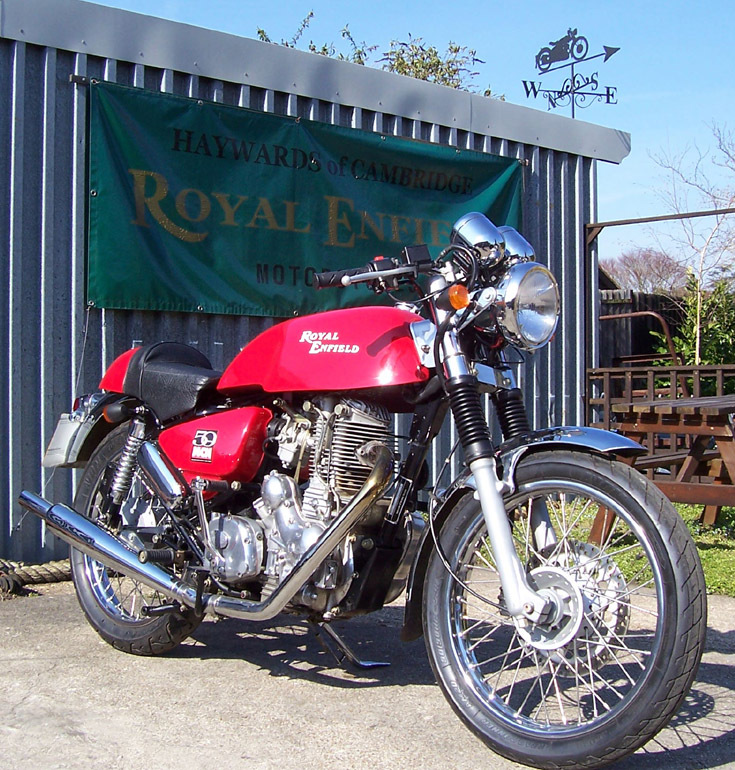 This may be modest compared with modern Japanese superbikes, but it was compatible with machines of the 1960’s – the Royal Enfield Continental GT, introduced in 1964 - which produced 21.5 bhp. In real terms, the Electra Sportsman was capable of mixing with traffic on A-roads and motorways, with the added reassurance of modern reliability and aftersales support via the nationwide dealer network. The Bullet Electra XR was launched at the 2005 Motorcycle Show in conjunction with Motorcycle News to celebrate the publication's fiftieth anniversary. 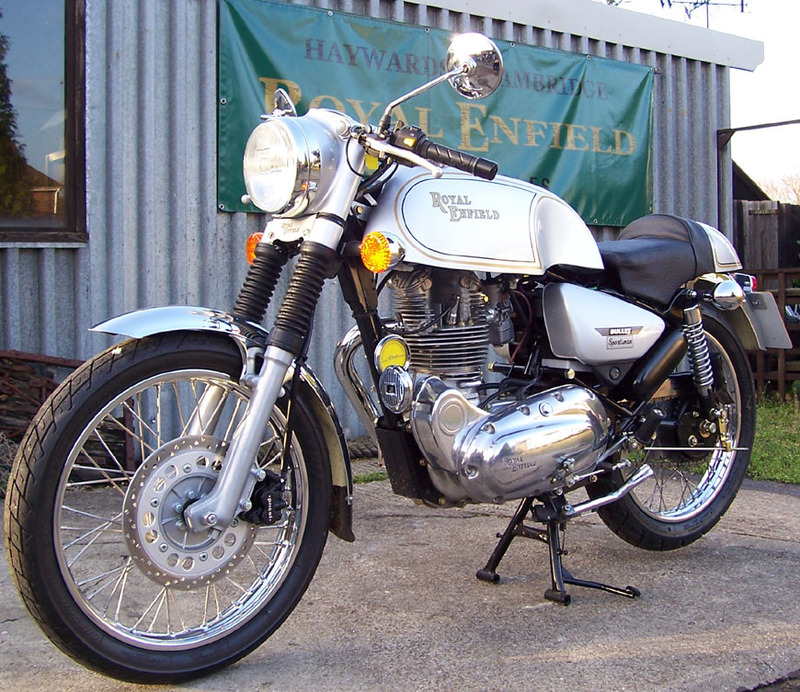 This exclusive model was initially supplied only through Motorcycles News, but was later made available through the Royal Enfield UK dealer network. Engine tuning to give 30% more power than standard. The Electra Clubman was based on the popular Electra 500cc single and was developed by Royal Enfield’s UK distributors Watsonian-Squire. Most of its components were British-made including the 4.5-gallon polished aluminium tank, complemented by a glass fibre single seat unit. Closer inspection revealed many other period details, including ‘ace’ bars and hand made rear-set footrests, plus discreet mini indicators. 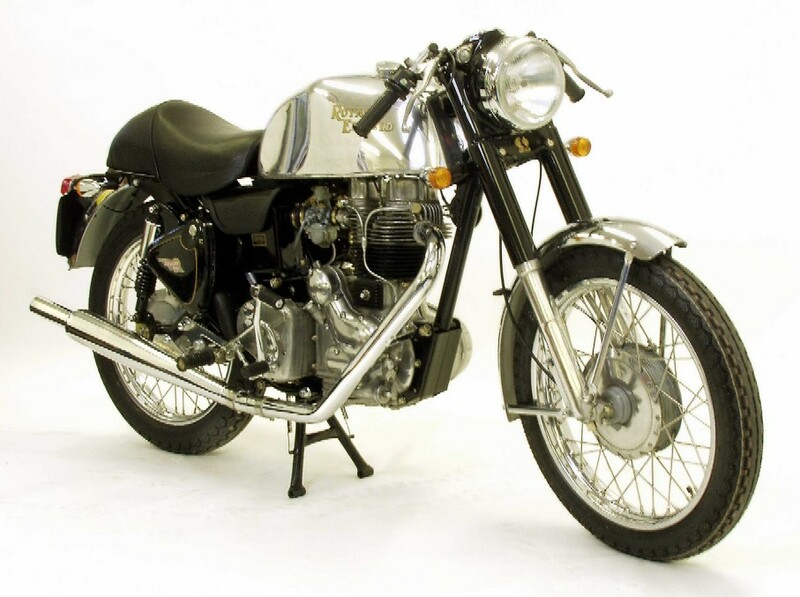 The upswept ‘Gold Star’ style silencer was key to the design changes, as it allowed the lean burn engine (designed to help Royal Enfield meet stringent modern emissions controls) breathe more freely. Maximum power was boosted by 10% compared to the standard model, but owners could expect to see fuel consumption in the region of 75 MPG. The Avon Super Venom tyres gave reassuring road holding, while the 280mm single front disc provided plenty of stopping power. Front brake – single disc, 280mm dia.